Nova Ball is a space/sci-fi accelerometer game. In the game you control the ball by holding your device parallel to the floor and tilting. The game has three modes: arcade, mayhem and missions. In arcade mode you need to see how fast you clear each level. Mayhem is all about survival; stop the stars reaching critical mass. In mission mode you have to clear each level to progress to the next. Arcade: This mode is all about speed. Collect the stars to clear the level. The race is against the clock! Mayhem: Stop the stars reaching critical mass when the star coverage reaches 75% then critical mass will be reached. Not good! 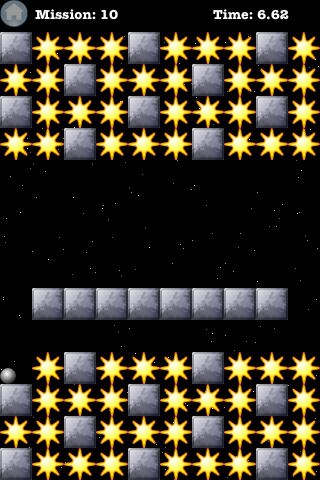 On the first level you need to survive for 75 seconds and then with each level you need last 5 seconds longer, e.g. 80 seconds for the 2nd level, 85 for the 3rd and so on. Mission: Clear each level to progress further and further. There are 50 fun levels to play through. You can download it for $0.99 (or 0.59 GBP or 0.79 Euros) from iTunes. The BibleBase Daily Bread App is a Bible reading schedule based on a 3 year cycle. You can download it FREE from iTunes. A simple to use utility to calculate the distance to a storm based on the time elapsed between the lightning and the thunder. When you see the lightning: hit the 'Lightning' button, then when you hear the thunder: hit the 'Thunder' button. The distance to the storm will be shown. Welcome to 7 or 11 where maths meets physics. Using an advanced 2D physics engine, 7 or 11 is a fun game with balloons, cacti and prime numbers! 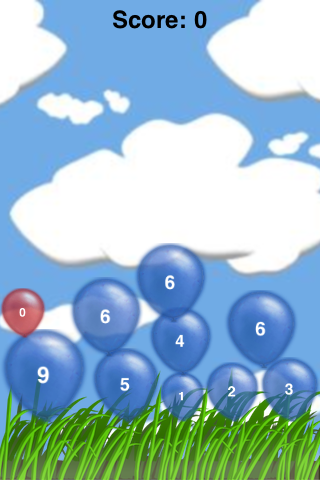 The idea behind the game is simple, tap on the falling balloons to make running totals of either 7 or 11. If the total goes over 11 you go bust and the game ends! So be quick but be careful. The game has two modes, Easy and Hard. In easy mode you have plenty of time just make sure the balloons don't fill the screen. In hard mode use the "Blow" button to make sure the balloons don't hit the cacti. So come on, don't wait, get the app and start popping those balloons! Wondering how far away that storm is? Want to teach your kids how sound travels slower than light? Did you ever need to take your kids mind off a thunder storm? Using Thunder Clap HD you can teach your children and distract them from that rumbling thunder. Following the success of Thunder Clap on the iPhone and iPod Touch, here is Thunder Clap HD built specifically for the iPad. 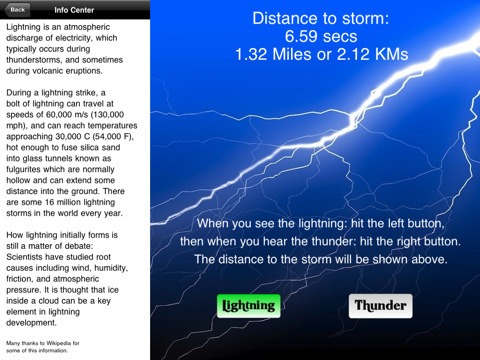 Thunder Clap HD is a simple to use utility to calculate the distance to a storm based on the time elapsed between the lightning and the thunder. 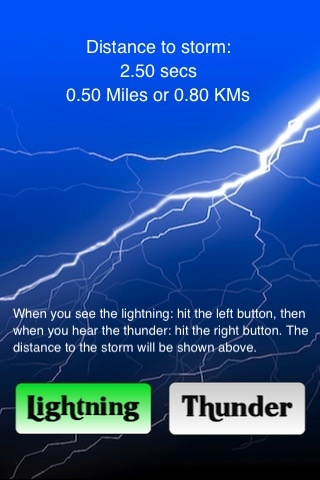 When you see the lightning: hit the 'Lightning' button, then when you hear the thunder: hit the 'Thunder' button. The distance to the storm will be shown. The iPad version has some new extras including higher resolution graphics, full rotation support (it doesn't matter how you are holding your iPad) and an Information Center with some notes about the nature of Thunder and Lightning and a bit about Benjamin Franklin. Then I saw in the right hand of him who sat on the throne a scroll with writing on both sides and sealed with seven seals. And I saw a mighty angel proclaiming in a loud voice, "Who is worthy to break the seals and open the scroll?" But no one in heaven or on earth or under the earth could open the scroll or even look inside it. I wept and wept because no one was found who was worthy to open the scroll or look inside. Then one of the elders said to me, "Do not weep! See, the Lion of the tribe of Judah, the Root of David, has triumphed. He is able to open the scroll and its seven seals." Then I saw a Lamb, looking as if it had been slain, standing in the center of the throne. Copyright © 2005-2007 Gary Sims.